BC Networks utilizes SAVVIS’s world-class “Class-4” Internet Data Center facility (which is SAS70 Type II Certified) for Power Management, Heating/ Ventilation/Air Conditioning (HVAC), Fire Suppression, Seismic Engineering, Physical Security, Tier 1 Internet connectivity and access to our Intelligent IP and IP MPLS network. Through these premiere facilities, BC Networks customers can select from a comprehensive suite of IT services including Co-location, Managed Hosting, Managed Security and Managed Network solutions; all designed to meet the operational requirements and financial objectives of our customers. The SAVVIS SC9 Data Center, located in Santa Clara, CA offers 87,960 square feet of premiere data center space designed to meet the stringent demands of Enterprise customers. SAVVIS provides a full suite of hosting services through the SC9 Data Center from simple Co-location to Fully Managed IT Infrastructure. Located in the heart of Silicon Valley, the SAVVIS SC9 Data Center is just 5 miles from the San Jose Mineta International Airport and offers a number of lodging options for out of town customers. Hotel options within a 5 mile radius of the SC9 facility include; Hilton, Marriott, Holiday Inn, Hyatt Regency Embassy Suites and Westin. The SC9 Data Center is a single story building, SAVVIS is the sole tenant. Silicon Valley Power provides three Feeders from diverse substations. Electrical system consists of 5 bus system and a total of 6 Power Generators. Each primary bus has one 2.5 mW generator and three 750kVA UPS. The reserve bus has one 2.5 mW generator. Power Transfer from primary to alternate power source will be seamless (within 4 ms, ¼ cycle). Chilled water computer room air conditioning (CRAC) units supply cooling for the raised floor areas. Chilled water is supplied by a chilled water plant consisting of water cooled chillers, cooling towers, condenser water pumps and primary – only variable flow chilled water pumps. The power feed of all CRAC units and chilled water plant equipment are equally distributed across all electrical bus with sufficient capacity to withstand one electrical bus failure. 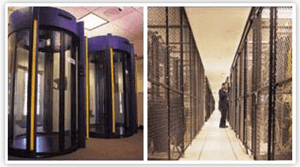 Two makeup air units provide humidity control and ventilation air for the data center. HVAC features include humidification at the makeup air units, air supplied through a 30 inch raised floor, and an integrated Building Management System. NODE has separate computer room air conditioning units (CRAC) in N+1 configuration. VESDA provides early warning detection; dual interlock pre-action fire sprinkler system. Two initiating device inputs, heat detector and loss of air pressure, are required to activate water to flow into the pipe. Under normal operation, the sprinkler pipe contains no water. The fuel system has been designed to provide 48 hours of continuous run time under full load without refueling. Submersible pumps transfer the fuel between the main tanks and the day tanks. System features include redundant transfer pumps, dual controls, a fuel polishing system, leak detection, and integration to Building Management System. Automated Logic Controls (ALC) Building Management System monitors and controls HVAC system. Square D Power Logic System monitors mission critical power system. Building grounding system exceeds NEC and IEEE standards. A signal reference ground system compliant with the National Electrical code and ANSI/TIA-942-2005 installed. SAVVIS, Inc. (NASDAQ: SVVS) is a global leader in IT infrastructure services for business applications. With an IT services platform spanning North America, Europe, and Asia, SAVVIS is an industry leader in delivering secure, reliable, and scalable hosting, network, and application services. These solutions enable customers to focus on their core business while SAVVIS ensures the quality of their IT systems and operations.